Where is your mobile coming from? This simple question is not easy to answer as the mobile has been assembled using components from different countries (including the domestic) and by using services from the domestic and foreign economies. This multi-country nature of products is not only a feature of more complex high-tech products (such as mobile phones, cars, etc.) but in almost all cases a product is not made up entirely of components or inputs from the country where it is finally assembled or sold. At least some of the components and services (e.g. transport services) necessary to bring the final product to the customer are sourced abroad. This is the case for direct inputs in the way that firms purchase intermediate inputs for production domestically and abroad but even more so in an indirect way: A component from a particular country may already embody other inputs from other countries which are thus used indirectly when using this component for production purposes. The other way round, companies may ship high-tech components to other countries where assembly of the final product takes place. Based on this background of the importance of the multi-country nature of products, the report provides a detailed analysis of the structure of the international production process and trade in intermediates with respect to EU countries at various levels. 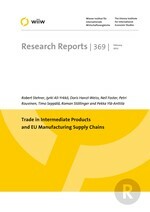 Using information gathered from detailed trade statistics, the report analyses the relative importance of trade in intermediate products in overall trade, the respective changes over time and the important differences among the EU-27 countries. Here the importance of considering both exports and imports of trade in intermediates is emphasized. The study investigates the geographic structure of sourcing and provision of intermediates, pointing out important regional shifts, specialization patterns, the significance of two-way trade in intermediates, extensive and intensive margins by use categories and other characteristics such as quality aspects. The report then continues providing information on the using side of imported intermediates and its role in inter-industry linkages. This is further exemplified at a very detailed level – at the level of a single product, the Nokia N95 – analysing the complexity of international production processes for a high-tech product. Finally, the study provides insights into the effects of the crisis on trade in intermediates – whether being a cause or consequence of the trade collapse – and potential implications for future developments.